Saturday, 6th: Dan grading at 10:00. Course (open to all) 15:00 to 17:00. Sunday, 7th: Course (open to all) 10:30 to 12:30, and 15:30 to 17:30. 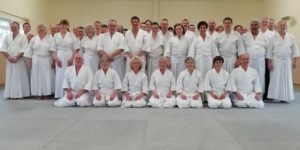 Kyu grading at 12:45 - the results will be announced at 17:30.